The new Congress will be seated in a matter of days — but it is almost certain that the seat from the North Carolina Ninth Congressional District will be left empty, as more evidence of a brazen vote-tampering scheme piles up. 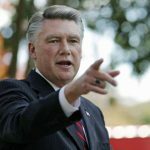 The bipartisan state elections board has refused to certify the results of Republican Mark Harris’s win and instead set a hearing on the election fraud scandal for January 11, a week after new members are sworn in. Harris beat Democrat Dan McCready by roughly 900 votes on Election Day. But those results have been marred by explosive allegations that an operative working for the Harris campaign collected, tampered with or even destroyed absentee ballots. The alleged plot is now the subject of a state inquiry; the findings of the state investigation will be presented at the hearing next month. Depending on the outcome, a new election could be called. The state board has broad discretion under state law to call a new election if the basic fairness of the November vote is in doubt. The evidence continues to pile up. On Christmas Eve, Joe Bruno, a reporter for the local news outlet WSOC, added another piece to the puzzle. Three voters testified in sworn affidavits that they had filled out their absentee ballots and then given them to a person who came to their house and promised to deliver the ballots to state officials to be counted. Bruno checked public voting records and found that none of those voters had actually had their ballots counted. The picture isn’t yet complete, but the evidence we do have suggests that this could very well be one of the most duplicitous election fraud schemes in recent memory. Let’s tick through the evidence. It’s important to remember two things about absentee ballots in North Carolina: Anybody can request one, and, at the end of every day before the election, state officials publish a file of which voters requested an absentee ballot by mail and whether they have returned it to be counted. A campaign could wake up every morning and check that file to know how many registered Republican, Democratic, and unaffiliated voters had requested and returned a mail-in ballot. “From a mechanics point of view, this is a goldmine of information for candidates and their campaign,” Michael Bitzer, a politics professor at Catawba College, told me previously. Two counties in the district, Bladen and Robeson, had an unusually high number of absentee ballots that were requested but not returned for the 2018 election. Several voters in those counties said in sworn affidavits that an unidentified woman came to their house and collected their absentee ballots. One voter said the woman promised to finish filling out the incomplete ballot for them. Another voter said the ballot was not signed or sealed when the woman took it. In an interview with WSOC, the voter who said she’d selected her choices for only two offices on the ballot before handing it away identified Lisa Britt as the woman who collected her mail-in ballot. Britt is the stepdaughter of Leslie McCrae Dowless Jr., a political contractor in the area, BuzzFeed News reported. Dowless was paid by the Harris campaign and was doing absentee work specifically, according to the Charlotte Observer and other affidavits sent to the state elections board. He was previously caught up in allegations regarding absentee ballots in 2016. The Harris campaign still owes $34,000 for absentee ballot work it hired outside contractors for, the New York Times reported. Britt and another woman related to Dowless, Jessica Dowless, told BuzzFeed News they were working for Dowless at an office during the campaign. They described counting the number of Democrats and Republicans who had voted. Absentee ballots were collected and brought to the offices. Dowless was paying his workers cash, even buying one person a car, and some of the staff were using drugs while on the job, per BuzzFeed News’s reporting. Britt and Jessica Dowless were two people who witnessed an unusually high number of absentee ballots that were submitted in Bladen County, according to Judd Legum at Popular Information. Jessica said she was asked to witness ballots that had been brought back to Dowless’s offices. That is a lot of smoke, and you can see the contours of the scheme: People working to support the Republican campaign were collecting absentee ballots en masse and serving as witnesses for them. What actually happened to the ballots that were requested but not returned in Bladen and Robeson counties? How much did the Harris campaign know about Dowless’s activities? Was the unusual activity limited to Bladen and Robeson counties, or are absentee ballots from other counties also in doubt? Without the answers to those questions, it’s hard to say definitively what the precise scheme was — though the new evidence uncovered by WSOC suggests ballots may have been destroyed or discarded. There were already legitimate concerns those ballots were mishandled, given the testimony of ballots that were collected unfinished or unsealed. We can say that much for sure. But the list of outstanding questions is long. Another one: Were specific voters targeted? Jessica Dowless indicated to BuzzFeed News that ballots for Democratic or black (or both) voters were a focus, but later seemed to walk that claim back. Bitzer ran the numbers and found something odd about the absentee ballots in Bladen County: Harris would have needed to win every single unaffiliated voter and a good number of Democrats in order to rack up the margins he saw on absentee ballots there. But again, that data gestures at impropriety but doesn’t provide a smoking gun. That’s what we’re waiting on. Most of the attention has focused on two counties in the Ninth: Bladen and Robeson, in the southeast corner of the state near the South Carolina border. Notably, each of the affidavits provided by Democratic attorneys involved voters in Bladen County, and one man said that Dowless himself had stated he was working on absentee ballots for Harris in the county. Bitzer documented the unusual trend in those counties: They had a much higher rate of mail-in absentee ballots that were requested but not returned, compared to other counties in the Ninth District. And at the district level, according to Bitzer’s calculations, the Ninth had a much higher rate of unreturned absentee ballots than any other district in North Carolina. Bitzer also found that the share of votes Harris received from mail-in absentee ballots in Bladen was remarkably high. It was the only county where the Republican won the mail-in absentee vote, earning 61 percent to McCready’s 38 percent. Strangely, though, based on the partisan breakdown of absentee ballots accepted in the county, Harris would have needed to win not only all of the Republican ballots but also almost every single ballot from voters not registered with either party and a substantial number of Democratic ballots as well. Much like the sworn affidavits, there isn’t an outright allegation of wrongdoing to be found here. But the suggestion is pretty clear: Harris seems to have benefitted from an oddly high share of votes in these two counties, where an operative of his was allegedly working, and where a number of voters said that their absentee ballots had been collected from them in a highly unusual manner. Previous : Wednesday is day 5 of a partial government shutdown. It could go on for a while.